Gun Control Activists March Across The Brooklyn Bridge Demanding Action : The Two-Way One group demands that "not one more life be ended by senseless gun violence." The two main groups leading the march are funded in part by former New York mayor Michael Bloomberg. Demonstrators raise posters as they march across the Brooklyn Bridge to call for tougher gun control laws on Saturday in New York. Hundreds of activists marched across the Brooklyn Bridge on Saturday, demanding reforms to the country's gun policies. 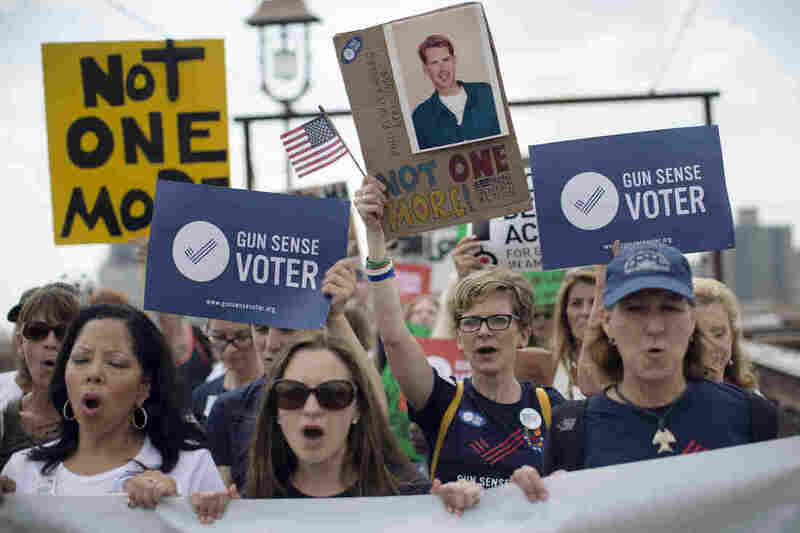 The march was organized by two groups — Moms Demand Action for Gun Sense in America and Everytown for Gun Safety — after a series of news-making mass shootings. In a press release, Moms Demand Action says they want "common-sense" reform that includes closing loopholes that allow some gun buyers to skirt background checks. "About 1,000 activists gathered in downtown Brooklyn and are marching across the bridge to City Hall. "That's the rallying cry uttered by Richard Martinez, whose son Christopher was shot to death in Santa Barbara, California, last month." Among the protesters is Erica Lafferty, whose mother was gunned down during a rampage at Sandy Hook Elementary School. The two groups at the center of the protests are partially funded by former New York Mayor Michael Bloomberg, who has become a prominent supporter of more stringent gun control.